Two more serious types of inflammatory acne are nodules and cysts and the conditions they create are known as nodular acne and cystic acne. Both nodular acne and cystic acne are severe forms of acne and can lead to permanent scarring and even disfigurement. Large, deep and painful bumps, acne nodules and cysts are filled initially with blood, then with pus. They can linger under the surface for weeks or even months and can eventually harden. They may also leave deep scars. What Is Nodular Acne and Cystic Acne? Nodules are large, larger than pustules and papules and form deeper within the skin. They feel solid and hard to the touch and can be quite painful. There may be a firm, rounded reddish bump on the surface but the bump can also be flesh-colored. They develop when oil and bacteria deep inside a pore spreads, infecting adjoining follicles. Nodules can harden into deep cysts and may leave deep scars, on many levels. Cystic nodular acne is the most severe form of acne. 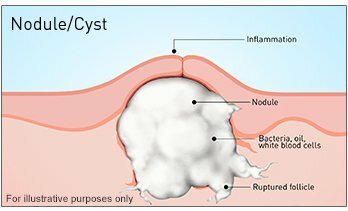 Acne cysts (or cystic acne) consist of deep, pus-filled lesions that look similar to boils. They are usually painful and can cause scarring. Sizes of acne cysts range from as small as a pencil eraser to much larger. It’s easy to be confused about whether a specific severe breakout is cystic acne or nodular acne. The two acne conditions are similar, both are severe, and both should be treated by a dermatologist. Cysts are deep, painful, pus-filled bumps that can be quite large, measuring up to an inch or more. Cystic acne often runs in families and may result in permanent scarring and disfigurement. It’s also most common in teenage boys and young men. What Causes Nodular Acne and Cystic Acne? Nodules and cysts start like other pimples. A pimple can be formed when a pore in the skin gets clogged because of a combination of sebum and dead skin cells. When bacteria is trapped as well, the area becomes infected, red and swollen. Nodular acne and cystic acne occur when the infection goes deep into the skin. A much larger bump is formed, one that hurts and may also itch. Cystic acne is most common in teenage boys and young men who tend to get it on the face, back, upper arms and shoulders. But women also get nodular acne and cystic acne. In women, the cystic acne often appears on the bottom half of the face. There is also a genetic component to nodular and cystic acne. If one of the parents had severe cystic acne, their child may also have a greater chance of getting it. Over-the-counter topical medicines that work on milder acne often have little effect as nodular acne and cystic acne treatments. Not sure how to treat nodular acne, cystic acne, or any form of scarring acne? You needs immediate attention by a dermatologist. A doctor or dermatologist will have the best solution for nodular acne treatment. Nodular acne and cystic acne are the two most severe forms of acne. Breakouts often cover large areas of the face, back, shoulders and arms. The acne nodules and cysts can be very painful and can leave significant scarring. Because the nodules and cysts are below the skin’s surface, topical nodular acne and cystic acne treatments are often ineffective and a doctor or dermatologist should be consulted.